Maya thought I was a total crack-up when she came into the bathroom and couldn't "see me." She kept tilting her head trying to see my face behind my mud mask. And she was smiling and giggling and trying to poke at my face. Good to know she still recognizes me even when I look like Swamp Thing! Try THIS one out. It's worth it! you're so brave to share that picture. thanks for the laugh! hilarious!! and I love the dot on her nose. audrey cries when she sees me wearing a mask. sending healthy computer vibes your way! Too cute! 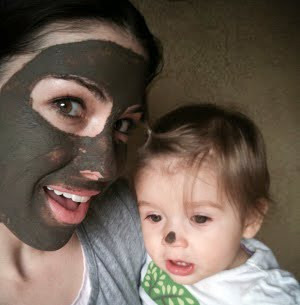 That looks very much like a charcoal mask I have... Origins? If you have a Lush store near you, you should try their masks ( as a mask connoisseur) They are so fresh you have to keep them in the fridge and they feel great!